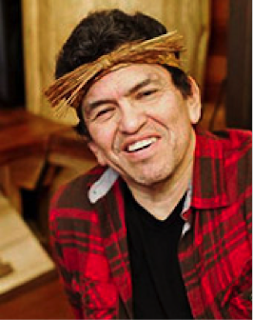 The public is invited to experience the power of oral history from a Native American master storyteller on Wednesday, November 28, in another of a series of monthly programs sponsored by the Kenmore Heritage Society. The program, “Teachings of the First People,” starts at 6pm in the Hangar at Town Square, 6728 NE 181st St. in Kenmore. All are welcome. Roger Fernandes, or Kawasa as he is called by his fellow members of the Lower Elwha Band of S’Klallam Indians, has strong feelings about how stories should be shared. A tribal historian, artist, and teacher specializing in Coast Salish art, Fernandes believes stories should not be trapped in books. Fernandes began story-telling by sharing simple legends, then enlarged his subject matter to include myths, creation stories, flood stories, and stories about heroes. They teach non-Natives about the complexities of the Indian cultures, going beyond the basics of food, shelter, and clothing. Admission is free. Light refreshments will be served. Door prizes will be given. The society’s series of monthly programs is made possible with support from the City of Kenmore and 4Culture.